Not able to pick up your order at our store? Some of our novelty items can be shipped! Visit our Superior Celebrations website for sparklers, confetti cannons, smoke, and other unique products for your next celebration. 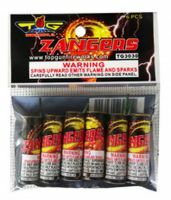 Zangers spin on the ground with red and green sparks, then zip into the sky in high speed. 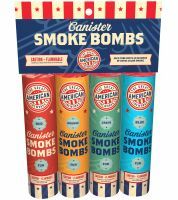 These smoke bombs emit long-lasting red, blue, green, and orange smoke! Space Capsule is a uniquely-designed aerial spinner that spins on the ground with a shower of sparks before launching into the air with a whistling, silver tail. The classic snappers that everyone knows and loves. A fun noisemaker that pops when thrown on the ground! The classic snappers that everyone knows and loves. A fun noisemaker that you throw on the ground for a satisfying pop! 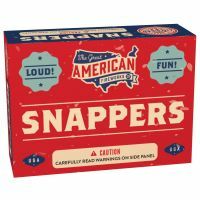 Each bulk pack contains 50 packs of snappers. 10" gold sparklers are a must-have for any celebration. They are made with a wire core, so they give off minimal smoke while burning with a bright gold sparkle. 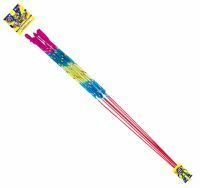 These extra-long, 36" morning glory sparklers burn with multiple colors and effects. This pack of 72 star-shaped sparklers is perfect for any celebration! Simply light them at the tip and enjoy the golden sparkle as it burns down both sides of the star. This classic novelty produces a trail of ash as it burns that resembles a snake! Each pack includes 6 different colors. 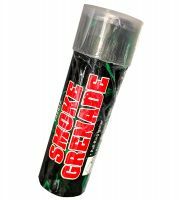 Pull-string smoke canisters that emit vibrant, colorful smoke for a full minute. Available in white, red, green, yellow, purple, orange, or pink. 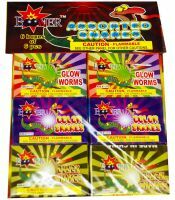 These 10" color sparklers come in three colors (red, green, & gold) - 4 boxes of each color. These are the classic morning glory sparklers you know and love, with a three-stage, multi-effect performance on a bamboo stick.